Meet Roxanne, the Detroit Zoo's newest aardvark, born January 8. She will be introduced to the public this spring . 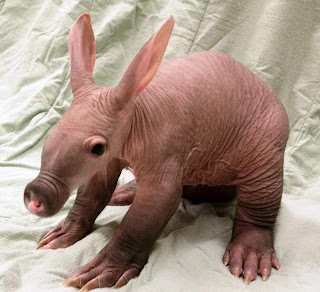 An aardvark (Orycteropus afer) is an African mammal whose name derives from the Afrikaans word "earth pig." I'll be in Detroit visiting family next month and hope to see this strange, sweet little creature! I like how they put the cut thing on a backdrop...a true model! I noticed that. They probably didn't want discarded food and feces in the shot. Besides, if the background were distracting we wouldn't see every little wrinkle on this dude's piggish skin!